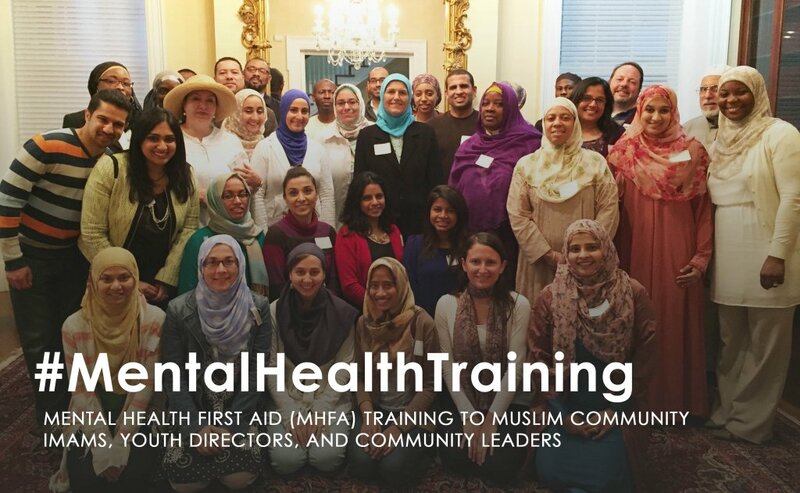 AMHP has also received funding for a grant to provide Mental Health First Aid (MHFA) training to Muslim community leaders in the Washington, DC area.The training presents a unique opportunity to engage an audience of imams, youth directors, and community leaders in order to increase capacity to identify and triage individuals in our community who might be suffering from mental health issues. This cutting edge initiative will help fulfill a great need for improved mental health awareness within our community. MHFA is an internationally recognized curriculum supported by evidence-based research and has been offered on a limited number of occasions by and for Muslims in the United States within the past year. Photo Above // Saturday September 27th, 2014 Mental Health First Aid Training held in Washington, DC was an incredible collaboration between Muslim Wellness Foundation, Inc., sponsored by American Muslim Health Professionals (AMHP) and made possible through the generosity and support of El-Hibri Charitable Foundation. The participation in this effort was groundbreaking as it represented the FIRST training held in the Washington DC area specifically for the American Muslim community. Tweet this!! American Muslim Health Professionals (AMHP) is a non-profit organization with an outreach of over 7000 health professionals and students working to leverage the educational background and skills of Muslims in the health care sector to improve the health of Americans.